Question: What does it mean to reveal the higher force, to uncover its intention, to reveal where it is leading me, and to uncover what it wants? Answer: Ramchal (Moshe Chaim Luzzatto, a great Kabbalist who lived in the 18th century in Italy), wrote that the wisdom of Kabbalah is intended only in order to learn the governance and purpose of the higher desire: why the Creator made all of these creations, what He wants from them, and what will be the end of all the incarnations of the world. You reveal the entire program of creation, all the forces that activate it, and you begin to receive the right to enter this program and control it, instead of the Creator. It is like with a child who grows up, and a father hands over his business so that the child will continue running it instead of him. This is what it means to become a human being, man, since “man” (in Hebrew “Adam,” from the word “Domeh,” similar) means similar to the Creator, similar to the upper. This is what we need to reach. Question: Does this revelation affect the everyday life of a person? Answer: Of course! First of all, you become the master of everything that is happening. You know what you are living for and how to arrange your life in order to extract from it the greatest benefit. Baal HaSulam writes in the article “The Teaching of Kabbalah and Its Essence” that the wisdom of Kabbalah is the revelation of the higher governing force in all its properties and manifestations unfolding in the worlds and subject to the revelation by man in the future, until the end of all generations. In other words, you see all the prospects ahead, until the end of the existence of our world at 6,000 years counting from the first revelation of the Creator to Adam HaRishon 5775 years ago. You will reveal the future. We open the book and read: Behold that before the emanations were emanated and the creatures were created, the upper simple light had filled the whole existence. Where is all of this found? This is so far from us, outside of this world and universe, outside of this space in which all of us exist together with our planet, the sun, and all the stars. All of this is absolutely abstract and detached from our world. No practical benefit is seen nor any concrete means that would make it possible to improve our lives and perform any actions. It is suggested to us simply to study. So what is the meaning of this? Besides that, there are those who say that because this study is too abstract, it is possible to go crazy. Since studying the Talmud and Mitzvot (commandments), the Shulchan Aruch makes it possible to apply the study to practical activities and is preferable for the organization of our lives. We are able to provide a good education and information to children so that they will be able to proceed in the way of their ancestors. It is customary to think that religion brings benefit to people while the wisdom of Kabbalah is like some kind of philosophy. So why does an ordinary person need this? Such an opinion is widespread and common in the world. Or people think that with the help of the wisdom of Kabbalah, it is possible to do miracles by activating forces from the next world. And so the wisdom of Kabbalah seems even more dangerous for you are apparently working with mysticism and are liable to harm yourself and others. People are against anyone being involved with it at all, for who knows what you are liable to do? Maybe you will get access to some red button through which it will be possible to blow up the whole world. But all of these erroneous opinions are the result of absolute ignorance. People don’t understand that the wisdom of Kabbalah is the most practical of sciences and by being involved in it, it is possible to attract the Light that reforms. In truth, it is difficult to explain this. Even those who come to study in the beginning don’t understand what they really want and what they came for. After years of study and learning, it is gradually revealed to a person that Kabbalah is a practical method only. This is because with its help, we awaken a unique power that changes everything in our world, a power that is called the Upper Light. If we don’t attract this Light, it still acts according to its plan. And so it controls us in any case, but only in a form that is quite unpleasant and not desirable for the upper force or for a person. We cannot say that a person knows himself, not to mention humanity in general. As a result we cannot know this world, which is the entirety of all the levels: still, vegetative, animate, and human. We cannot, primarily because we do not know ourselves. We have to admit the fact that even psychology isn’t a science in the true sense. A person’s essence always remains an enigma to us. We see the outcome and the consequences of different processes on ourselves by our reactions to something and we study them in a very limited manner as we are dependent on and biased in our assessments. Moreover, we are helpless when we want to ascend to a higher level—the one that created us—and even higher to the plan of creation. Judging by different events and by our own personal experience while advancing, we see that all the forces of nature are in one system that is whole and integral. These forces operate according to certain processes and are operated according to a certain general plan that we know nothing about but are included in. But the natures of the still, vegetative, and animate fulfill the plan instinctively, by the command of nature’s orders, while we, along with the feeling that we are involved in it, there is a sense of having our own actions. If we could approach the study of nature based on these two feelings, we could perhaps attain something. But science on the whole is not engaged in research of the human level because we have no real means to measure it. Consequently, we only observe what is happening, and this is the essence of our studies. We observe, collect data, and establish a system of scientific knowledge. In addition, we use our modest options to influence the various phenomena and states of still, vegetative, and animate nature, as well as man, and observe the reaction that allows us to understand something. Even if we ignore the fact that all our observations and studies are based on our subjective perception.the results are still a summary that, in essence, give us little. After all, they are derived by our five limited senses. By studying the flora and fauna, we can see the range of our perception, but these results are uncertain, we compare them with ourselves and not the present standard. Our three-dimensional sight, the beat of our pulse, the movement of sun and the moon that measure a day, geological eras and the age of the universe, are all very subjective measures. Thus, our desire to know the universe is actually not too serious. A person is like a child who attributes unrealistic abilities to himself. Eventually we use only the forces of nature that we can reach. We collect and present them in simple drawings and use them according to our abilities. We do not differ greatly from prehistoric man who used a stick in order to build or to destroy. Our sticks are a bit different: particle accelerators, observatories, etc., but the principle is the same. We are just like babies who want to touch everything and put them into their mouths, but we are just on another level. We are not even aware of how limited we are. Here and there we discover that nature is much broader and deeper, but we don’t know to where and how it expands. We cannot penetrate into the higher dimensions or exit our three-dimensional frame: the coordinates of time, motion. and space. Comment: Let’s talk about the distant, but in fact very close history, the history of Babylon and the story of Abraham. This was 3,800 years ago. Answer: Essentially for me, there is another perception of history. For me it is alive even now, including Greece and Rome. Everything is alive today, for without this, it is impossible. Everything exists together with us, simultaneously. And so, around 3,800 years ago the ancient civilization of Babylon existed, which was similar to our civilization. The entire process began from that and gave a push to the development of modern civilization. A very interesting breakdown happened in those times. It is possible to say that it was an internal revolution in humanity that was concentrated entirely in one area. Until then it was a type of commune, a family that was not particularly connected, but also not quarrelsome. And suddenly everything changed. The fact is that a person has an ego. This makes us different from animals. As long as the ego is obedient to a person, we quietly arranged our lives and designed a kind of patriarchal order. But when this ego suddenly broke out and began to go crazy within us, we became detached from the animal world and became true humans. This created a basis for today’s breach, which is the level of the ego that dominates the world today. The civilizations prior to Babylon were much more primitive and not egoistic. Of course, also among them there was a hierarchy, rulers, and wars, but there was no concept like, “the ego that pushes us forward.” In other words, humans were not conscious that the ego was managing them, separating them, and bringing them to mutual hatred, the demand for an “ascent to the heavens,” and the aspiration to manage and trample everyone. That clear perception of an egoistic world did not exist then. And then another figure appeared who established the Jewish people, Abraham. It is noteworthy that Abraham came from a much respected family. In those times, one of the central pillars of society was the continuity of the generations because everything was handed down, including, until recently, the transfer of various crafts and skills. Terah, the father of Abraham, was a distinguished spiritual leader of the people. He was so revered that they created statues of idols in his family. It is possible to understand this as simply as it sounds: They made statues of idols and related accessories. But it is possible to say that they “created” ideas and concepts; meaning that they spoke about divinity and explained it to their people according to their understanding. So I would say more than this, they were the founders of the spirit of Babylon. It wasn’t Nimrod, but specifically the family of Abraham. This was a clear separation of power: On the one hand, there was the power of the state, “police,” the military, which was represented by Nimrod, and on the other hand, spiritual power, represented by Terah and Abraham who came after him. Each of them had a strong personality. And suddenly at a particular moment, from a particular point in his investigation, Abraham observed with what rapidity his own and others’ cruel egos were developing. While searching for the general global force that manages everything, Abraham discovered the integral system that manages creation. His essential question was that among all things in the world, there must be something in common that basically provides for the principle of unity and leads the world towards a particular goal. After all, we see how everything turns, and even if it rolls backward, at the same time it continues to advance, like the rim of a wheel. And so from facts and research, Abraham succeeded, through willpower, in penetrating this system by way of the filter, the screen (Masach). The filter is very simple; it is found between us. It is clear that entry into the world to come, the next dimension, is found in a place where it is possible to find a tangible bridge between people, where confrontation between them disappears and clear accommodation is created, meaning such a connection within which they dissolve one into the other. At this moment they discover gateways between them, entries into the next dimension; and you enter into it. There is nothing new here. In our world there are three components: still, vegetative, and animate. Regarding the person, if he is prepared to nullify his ego with regard to others, to rise above the ego and nullify it together with another person, then he acquires a new characteristic which becomes an entry into the next dimension. Question: How did Abraham succeed in discovering, from his investigation, that the main thing is found between us? Answer: He saw that the entire system of creation is integral and good and that all of its parts support each other. It is mutually connected and united. And here a single, ugly and damaging “nuance” was created, which was the person with his narcissism. He is, in fact, a beast, but he has an ego. And this ego pushes him towards a development that is not at all right, since it is against others, opposed to everyone, and in opposition to the still, vegetative, and animate. This means that he is not in harmony with them, in homeostasis. Instead he goes out of his boundaries, tearing everything up and dominating everything. What for? It’s not important. What is the goal? There is no goal. It is only to satisfy the ego that is burning inside. Abraham understood the global system of nature and the intent of the person that is absolutely opposed to it. So it became clear that the problem is within the person, that it is necessary to bring him to harmony, to be similar to nature. How is this done? He needs to be directed towards the right relationships with the still, vegetative, and animate nature, and most importantly with humans, within society. The civilization of Babylon encountered the process of globalization, as in our world today, and it closed in upon itself. After all, this was a small civilization, around three million people who were living in a limited space between the Tigris and Euphrates rivers in Mesopotamia. Incidentally, they were seriously developed. From there came astrology and esotericism, and was born what is today called the new age, the new era, as there were stores, flushing toilets, and water supply systems. Many of the inhabitants of the modern world could be envious of the Babylonians. Everything was very organized, nice, and neat among them. We simply cannot imagine how they lived. But suddenly everything exploded from within. Within 20-30 years, egoism broke out before the eyes of Abraham, and the Babylonians began to hate one another. This became a type of miniature globalization in which the inhabitants of Babylon, who were tightly linked, could no longer live together. By and large, the same thing is also happening today. We must live together, and on the other hand, this is impossible. And so the ego that erupted compelled the Babylonians to build a tower to the heavens. This was a natural, instinctive, direct expression of the ego, and the continuation of its activity. A new religion was created: “We must worship our ego, rise above the heavens, we must open everything up, reach the general welfare, and perhaps even equality and brotherhood. All of this is in our power to do,” This is very similar to the calls of the modern era: communism, Nazism, liberalism, and consumerism, whatever. They were all represented there together. Since the process was so rapid, strong unrest brewed within the society. Large factions were created: for Nimrod, against Nimrod, etc. But Nimrod was a very serious leader, and Terah, Abraham’s father, served him, so to speak, as his right hand, as the spiritual leader of the people. And Abraham, as a son and student, had to go follow the same path. In the history of humanity, continuity had always been desirable, especially in those times. But here something interesting happened. From his investigation, Abraham discovered a completely different picture and it became clear that the ego was given to us not to manage us, but so that we would manage it, and with its help, rise above it and truly ascend to the heavens. This is not to those heavens to which the Tower of Babel would raise us, rather to the heavens above which we rise, against it, against our ego that continues to grow. In other words, this was a completely different system! Question: So Nimrod, who understood that the ego separated people, proposed separation, spreading out over the face of the globe, and Abraham’s intention was the opposite, connection and work on this ego? Another stream proclaimed the opposite: “Tear everyone else to pieces and dominate. That is how we advance. All of life is a struggle, egoistic, and competitive, and the strong survive, like in nature.” At any rate, it appears to us that this is what is happening in nature. Question: This was the intention of Nimrod? And so Nimrod thought that we had to separate. If we separated and everyone was given a small apartment, we would solve this problem. Just get away from each other and everything will be okay. This decision is directed towards realization and management of the process. That means, in principle, to remain in control, and in this manner, to solve the problem of the large ego and social conflicts. Essentially, this is what capitalism today also proclaims: Each in his house, in his corner, in his particular area. This is mine; that is yours. Each one has his own inheritance. And a common government, a national structure also exists, and so on. This means that Nimrod is every modern government and modern perception in general. It is possible to say, that in part, what Nimrod thought has been realized: People scattered all over the globe and began, as it is called, to speak in different languages, and continued to live according to the laws of the ego. Nimrod’s position is very understandable and rational. He logically solved the problem that had been created. And Abraham went out with an absolutely different revolutionary thought that was derived from attaining the inner characteristic of nature. Today we have again come across the same problem, but there is nowhere to disperse. The ego has grown and we are so stuck, linked, to each other, and it is impossible to separate. If there were several additional nearby planets and a “bridge” to reach them, we would make the same attempt again. But we have a single planet Earth and now we have no choice but to solve the problem through the way of Abraham. Today, the forces of separation and disengagement are growing. Moreover, families divorce, many children separate from their parents, etc. Each one is searching for some corner of his own to be detached from everyone there. And what is interesting is that there are so many places in the world! In my flights above our planet I see clearly that humanity occupies only a few percentages of the entire area of the planet. But people cannot go far away from each other. They simply cannot. This means that we have reached a situation where the idea is no longer about an area for settlement, nor physical distance. Today we are linked much more tightly. So Abraham began to advocate his theory. Clearly, it seemed illogical and unnatural. In fact, it was impossible to prove it. It is difficult to understand this and to agree with it. But if you do this, in fact, you will be linked to all of global nature. This is a clear and logical conclusion: You become an integral part of nature because you are linked with all of humanity and become like the nature of the still, the vegetative, and the animate. Only unlike that, you have reached this general integral state through your own power. So you begin to feel the general nature, its general law, and the general power that is called the Creator. And you go out to the next level of development above the ego. Now you feel the world, not by way of your physical eyes, not by way of the animalistic, corporeal senses, but you begin to feel it by means of a completely new logic, by means of new desires, which are not beastly, not with an egoistic face, but from a truly human level. In conclusion, all modern civilizations emerged from ancient Babylon. Babylon is the basis for all of our civilizations, and furthermore, for all of our spiritual development. The Book of Zohar, the article “Among All the Sages of the Nations of the World, There Are None Like You,” item 161: Among all the sages of the nations of the world and among all their kingdoms, there is nobody who will reach you. We exist within a particular reality. There are two approaches to perceiving reality. The first approach is a scientific research. According to this approach, through our senses and the instruments that we construct to expand our senses in depth and breadth, we perceive the reality that we can feel with our five corporeal, earthly senses that also exist in animals. The study of reality as it is revealed to our senses is called science. The foundation of science is philosophy, the approach to the understanding of the human perception of reality. This doesn’t mean the philosophy of today, which has become a bad word since it doesn’t have any real foundation, but the original philosophy, what it once was. From that, degrees in all disciplines are called Doctor of Philosophy (PhD) as it is the foundation for all the sciences. In this article, The Book of Zohar speaks about the philosophical approach, meaning the scientific approach of each and every person to the world and life in this world, to his desire to receive, to his desire to bestow, to the Creator, to the creatures, to everything, but in a sound way that a person is able to perceive in his mind and feelings. This is the approach called philosophy. It is impossible to refute it because we feel, see, examine, and measure all that exists in front of us. However, there is another approach. If philosophy as science suddenly goes beyond its limits and begins to speak about phenomena that are not perceived by our senses, it stops being science and becomes some kind of mysticism, which is what today is called “philosophy.” This means that it is a philosophy without any real basis and without any practical examination. What is no longer within the limits of earthly sciences, such as philosophy, are things that go beyond our senses: the origin of life, what happens before birth and after death, and the system of management and supervision. It is impossible for these topics to be discussed, since they are outside of the areas addressed by these methods. This is within the realm of the wisdom of Kabbalah, which is a science for someone who develops additional senses within himself, and he examines and investigates with these senses. Then from his investigation, he constructs a new science in addition to the earthly sciences that we have developed with the help of our five current senses. Humanity developed, and through the five senses wanted to discover and use everything possible until it saw that in the end, everything that it attained brought it to a crisis and to a breakdown. This is our life. And then humanity began to probe and ask. If there was something here that had not been taken into account, with whom we are in contact, who is managing us, why do all kinds of things happen to us, and so on. We need additional data about the situation we are found in. This data is not revealed to us with our five senses. So what can be done? On one hand various mysticisms, religions, and faiths developed for people who were looking for what might possibly help. And on the other hand, the wisdom of Kabbalah has been revealed because it has become imperative, and it invites humanity to become familiar with that reality that we don’t perceive with our five senses. We can attain it if we develop an additional sense within us, which is not an extension of the familiar five senses, but another approach to perceiving reality: not that I swallow everything and examine everything within me, but I can go outside of myself and not be dependent upon my body, on my desire to enjoy that creates the body for me. I go outside of it and examine reality as it is. Then I don’t see bodies, and I don’t see reality as it is portrayed for me through my five senses. And so the world becomes Ein Sof (Infinity). The wisdom of Kabbalah speaks about this. It speaks in the same way as philosophy, but it defines precisely where the part of science of philosophy exists, as philosophy once was, and not the useless quibbling of today, and where the sequel to science is, meaning the wisdom of Kabbalah that penetrates a field that our five earthly senses cannot discover. We have to show the whole world that there is no other science except for the wisdom of Kabbalah and no perception of reality that provides any answers to the current reality in which every aspect of our life is in a state of crisis. It is the wisdom of Kabbalah that provides the right approach through which you acquire the proper tools necessary for our development. All the old tools and the means we had are useless today and only lead to confusion. It is simply impossible to advance using them. Physics, for example, is an accurate and true science that helps us benefit from the laws of nature. But we cannot use it to advance any further. At this stage we need new means, and the wisdom of Kabbalah provides them and allows us to be equipped with them. This means that in order to make another step forward on the path of our evolution, we need to change our paradigm, our basic approach, to adapt to the new conditions. Before people believed that they paved the way themselves, although it is actually the Light that fulfills everything. Now, however, we have to adapt to the new conditions and new states even if they appear against our will. Today we have to fix the connection between the vessels, and so we speak about the integral education. On the other hand, the earlier philosophic perception is outdated. We have to show people that any approach that is not based on real attainment cannot be used, and it actually leads us to suffering and prolongs the troubles. Any perspective that postpones the attainment of the Creator brings us many troubles. We, on the other hand, say the opposite: “You shall see your world in your lifetime.” The wisdom of Kabbalah is about the revelation of the Creator to a person here in this world. There is nothing spiritual after death. We pass away just like the animals that we slaughter, because we are on the animate level of evolution. I I don’t ascend and don’t fulfill my Reshimot (spiritual genes), and don’t develop the human level from my Reshimo, I remain a Reshimo. I have to fulfill my Reshimo by the Light that Reforms, and to bring my Reshimo to a state of the spiritual vessel in which I reveal the Creator. Thus we refute all the philosophic perceptions and the beliefs that humanity has created for itself. Our work is not abstract; we work for the revelation. This is what a person is faced with today. We have to reveal the Creator, here and now. In the News (from The Telegraph): “Professor Antony Flew, the rationalist philosopher who died on April 8 aged 87, spent much of his life denying the existence of God until, in 2004, he dramatically changed his mind. “‘It is thus perfectly possible that God might influence the creation in subtle ways that are unrecognisable to scientific observation. In this way, modern science opens the door to divine action without the need for law-breaking miracles,’ says Collins. My Comment: Science leads us to the realization of the beginning in nature: the cause, plan of development, and goal. However, scientists do not have a complete picture of the universe, including our world as part of it; for this there is the science of the actions of the Creator—Kabbalah. But the God of religions does not exist, there is nature: the laws, properties, and interactions that can be revealed and attained to the extent of similarity with these properties. How Is The Element Of Life Created? Our real existence develops in the desire and only in it. There is nothing but that. But, besides the desire and the picture that it creates in our feelings, I was given another temporary imaginary picture, an imaginary addition in the form of a physical body that is in a corporeal world. This reality doesn’t actually exist, but now it helps me be in an illusion of existence. When a real urge to use my initial desire will be revealed in me, I will approach it. One way or another, everything takes place in the desire, with the physical body that is simply an “animal” that has no freewill and is not required to do any work. This body is an opportunity to approach the real work in the desire and not more than that. The picture that is depicted by my corporeal senses is the imaginary world. This is why philosophical approaches and other methods of sophistry are so far from the truth. It is because they take the body into account, its actions and its imaginary potential, allegedly raising it above the animal level. Now I have only bodily desires that create the illusion of the existence of a live body. As a result, I have to take care of the body of this desire, to guard it, and to provide it with different things. This corporeal desire lives and dies. Besides that I have a point in the heart (•). I develop it by connecting with all the other points in order to attain love, and then in contrast to it, I feel aversion and hate. Then from zero to 100%, according to my exertion, I begin to develop the real ego inside me, the spiritual desire to receive. This happens when I enter the group, the right environment. Until then, I only have an “animal” and a point in the heart that may have appeared. There are people who remain in the system of the body with the point for a long time. Even if they study with the friends but don’t involve love, the group, and don’t keep the first condition (1), they don’t reach the second stage, the feeling of hatred (2). The point only stimulates them a little. Later when they start the real work with the group, they leave the previous system and move on to a new system, which becomes the only important thing for them. Everything that happens with the bodily desires is totally irrelevant. It should be satisfied with the basic necessities and not ask for more. We build a group among us, a network, and fill it with our mutual bestowal. On the whole this exertion is our desire to bestow upon one another. We raise a request (MAN) for correction, and in response the Surrounding Light comes and corrects and connects us, and then provides the filling, which is called the soul. The main thing is actually the transition from one system to another. This is the difference between philosophy and religions from one side and the wisdom of Kabbalah on the other. Baal HaSulam, “The Wisdom of Kabbalah and Philosophy”: …for we do not define by name or word that which we do not attain. That is because a word designates some degree of attainment. The root of everything is the unattainable and imperceptible essence of the Creator (Atzmuto). We never speak about it because something can be described something only on the basis of their attainment through our bodily senses when we analyze our sensations with our brain. A person consists of two parts: mind and emotion. The emotional part is a desire. The part that measures and explores is the mind, which develops next to the desire. If we don’t experience any “feedback” from either of these two parts, it means that we are deprived of the ability to perceive. The “insight” happens in the desire that lies underneath a dry, mental analysis. As it is said in the “Introduction to The Book of Zohar,” besides Atzmuto, there also exists an abstract form that we are unable to attain. As opposed to abstract form, both materialized form and matter are attainable. Thus, in Kabbalah, attainment occurs from bottom to top to the extent it is actually possible. On the other hand, philosophers do not contemplate the steps of ascent; they talk about some “force” that is outside us and scholastically deliberate on it as if this kind of “research” is legitimate. This kind of approach has actually ruined philosophy. Today nobody takes it seriously. When it comes to abstract conversations, everybody hypothesizes as much as they want to. Moreover, this principle lies at the very foundation of philosophy; a person can build their own picture of the world based on speculation; it is “legal.” This “pluralism” has resulted in a fountain of fantasies and nothing is left of the serious real foundation. The wisdom of Kabbalah, on the other hand, declares a very simple thing: Reality can be explored only by the observer, meaning, it can be researched only in conjunction with the explorer. Everything is evaluated through the observer and the picture that is created in the observer’s bodily sensors is in accordance with the law of similarity of properties. A person is comprised of both matter and form. Matter is the desire to receive. Form is the intention either for the sake of receiving or for the sake of bestowal. We perceive reality through ourselves in accordance with the level of our ability to change. What is outside us, we just don’t know. Discoveries of Kabbalists can’t be applied to our personal research until we achieve the same level they did. So, we use the wisdom of Kabbalah to attract powers from these steps, trying to reach them, like little children who strive to grow. In other words, we still use the wisdom of Kabbalah as a “special remedy” that is not clear to us yet, but it works. Then, when we attain revelation, we will research and apprehend the same phenomena inside our own vessels. At that time, Kabbalah books will help us examine ourselves and will direct our advancement. But still, we never know what actually is outside us. Kabbalists who advanced further due to their internal changes tell us about some 125 steps of attainment and describe what they have perceived at each of these steps. They outline specific remedies that will allow us to widen our limits of perception. Their desires are vessels of the soul; they perceive something called “Divinity,” the power of bestowal that emerged in them to the degree of their similarity of properties with Divinity. When receiving desires shape themselves as bestowing ones, they feel that “something” is fulfilling them. This “something” is called the “upper force” or the “Light.” But again, that, too, is perceived only by the person. So, the “Light” is a reaction that happens in our sensations, in our receiving desires, as it is being filled. In other words, the “Light” is a phenomenon in the vessel. Even the Light that in Kabbalah is called “external” is, in fact, located inside the vessels, only more distant from clear perception. One way or the other, it’s always about what is happening inside our sensations and desires. This is the way we advance. Regarding Atzmuto: according to our logic, we say that there is a higher root. We never sense it, nor will we ever attain it; however, by of course, there must be the source of our existence, of our sensations, and all the changes in us. And yet, no matter what we feel, we feel it only in accordance with our own properties. That’s why the “Creator” (Boreh) means “Come and See” (Bo-Reh). This phenomenon I also perceive internally and Atzmuto is outside us. The approach of the science of Kabbalah calls upon everyone to study reality. After all, there is the commandment, “Know your Creator and serve Him.” How? According to the principle “From Your actions we will know You.” Man changes himself and is constantly trying to come into agreement with the upper force and become similar to it. Then he feels the changes made in him, and according to these changes, begins sensing new phenomena. It is the upper force to which he aspired. So the “Creator” is a new modified form clothed in the changes that happen to us, the property of bestowal that is revealing itself within us. Subsequently, the wisdom of Kabbalah is very strict about its major rule: Never detach reality from the person comprehending it. Otherwise, we’ll end up being philosophers. 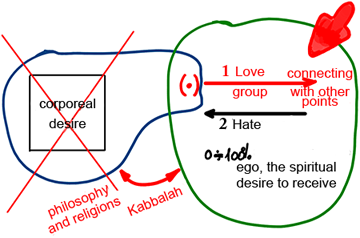 Baal HaSulam, “The Wisdom of Kabbalah and Philosophy”: Not only is it the wrong place to argue with them about their fabricated conjectures, but also the time of supporters of such views has already passed and their authority revoked. We should also thank the experts of materialistic psychology for that, which built its plinth on the ruin of the former, winning the public’s favor. Now everyone admits to the nullity of philosophy, for it is not built on concrete foundations. …Hence, we are grateful to materialistic psychology for handing it a deadly blow. This is a very delicate subject. At the time, philosophy tried to dominate the Jewish people and to take the place of the wisdom of Kabbalah. Psychology seemed to keep the place of the wisdom of Kabbalah, while philosophy has reached its end. But during the 20th century psychology has spent itself completely. In order to jump onto the table you have to jump higher than the table. Accordingly, we cannot investigate man without rising above him. As long as psychologists studied the natural “animal” tendencies of man, they succeeded. They even managed to identify and to organize the pyramid of desires that Abraham Maslow described. Still these are simple small revelations. At the moment, however, when psychologists are trying to penetrate a bit more deeply, they encounter great confusion. The problem here is that, in contrast to the exact sciences that study fixed laws that don’t change, psychology deals with “changing” laws. It’s because a person constantly changes, especially in our times. So the results of studies quickly become outdated: After several years both the researcher and his subjects change and are no longer who they were initially. So psychology doesn’t have a concrete foundation. It isn’t an exact science, but a combination of different minor, narrow, limited, individual studies. So eventually, today when philosophy has become a “dirty word,” psychology, too, is exhausted. We are now on the finish line.